Flevox Extra Large Dog Flea Treatment (OUTER 36 PIPETTES) is perfect for breeders or households that have multiple extra large dogs weighing between 40-60kg. 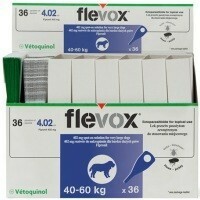 Flevox is a flea, tick and lice spot on treatment and prevention developed with Fipronil. The treatment will remain effective for up to 8 weeks against new infestations and newly arriving fleas are killed within 48 hours of landing on your cat. The product can also be used as part of a treatment strategy for Flea Allergy Dermatitis (FAD) where it has been previously diagnosed by a vet. Do NOT use on kittens less than 8 weeks old and/or weighing less than 2kg.